I’ve been in the weeds lately, starting a new job and finishing several freelance projects. Although we’ve certainly enjoyed our nightly aperitifs, I’ve had little time for anything more than old stand-bys, like Martinis and Old Fashioneds. But things are calming down finally, so it’s time again for research and experimentation. To that end, I delved back into a book that I bought a few months ago but haven’t taken time to review: The Art of the Bar. In flipping through it, I found a flavor combination that really surprised me–Cynar, tequila, and sherry–in a drink aptly named Choke Artist. Here’s why I’m no professional: I’d have never thought to match up these ingredients. But this drink just works. It’s the very definition of a well-balanced drink–everything’s present and notable, but nothing dominates. You can learn a lot about mixing from this drink. It reminds me a lot of those friendships we’ve all been a part of, where two strong personalities need a third, more laid-back, person to mediate the differences and smooth things out for everyone. That’s the role of the sherry here. Finally, the bitters. Even with five dashes’ worth, they’re subtle. But you should not be subtle. Instead, be fearless. Try it. 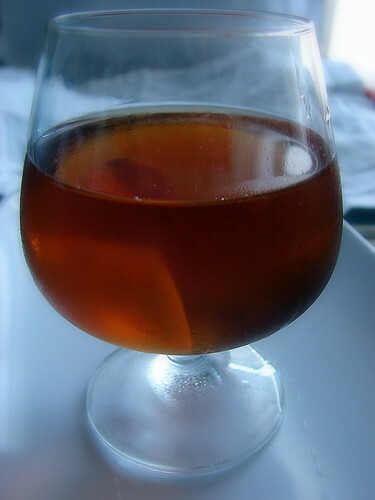 Technique: Combine the Cynar, tequila, and sherry in an ice-filled mixing glass and stir. Add the bitters to a chilled snifter and roll around to coat the glass. Pour the Cynar and tequila mixture into the snifter. Garnish with the orange twist. I was going to write this up for Mixology Monday this month, but I’m not sure it qualifies. This month’s theme is shooters, and to be honest, that just doesn’t really appeal to me. I’ve done shots too many times in my life, but I’ve never really enjoyed them. If I’m going to shoot back booze in one gulp, I’d rather knock back some whiskey than a shooter. So I didn’t know what to write up. My wife recommended sangrita, but that tends to be sipped alongside tequila. Rick’s criteria (in the comments here) indicate that a shooter is anything you gulp back in one shot. We didn’t do that with the sangrita or the tequila, so I don’t think we qualify. But because I love you, my sangrita recipe follows the photo and the jump. 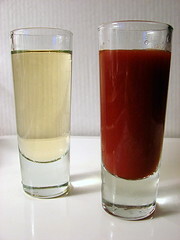 Sangrita is a traditional Mexican chaser for tequila, and there appears to be some dispute over the ingredients. Some say it’s citrus sweetened with grenadine and punched up with either salsa or dried chilies. Other people go crazy and puree up onions and peppers and garlic and whatnot. Still others insist that no sangrita should include tomato juice, whereas others are more lenient as long as you don’t use so much that it tastes like a Bloody Mary. I wasn’t really sure where to turn, so I winged it. I figured equal parts tomato and citrus would definitely keep it from the Bloody Mary camp. What resulted was a blend so balanced and tasty that I want to keep a jug of it in the refrigerator for breakfasts and hangovers. Note: I departed from the usual bitter orange because my wife is allergic to oranges. How much is a dash? How much is a dash of bitters? I always measure mine by the drop. I want my drink using bitters to taste the same as it did the last time. This is a very good question. I usually just do a quick dash of the bitters bottle into my shaker for a single dash, which isn’t very precise, but seems to give approximately the same amount of bitters each time. For ingredients that don’t come with that little cap with the hole in it–for example, for recipes calling for a dash of pastis or Cointreau–I measure out about an eighth of a teaspoon. Now “about an eighth” is imprecise in itself since I don’t have a one eighth measuring spoon, but I’m nearly always making two drinks at once, and I do have a one-fourth teaspoon measurer, so for those recipes, I can maintain some precision.